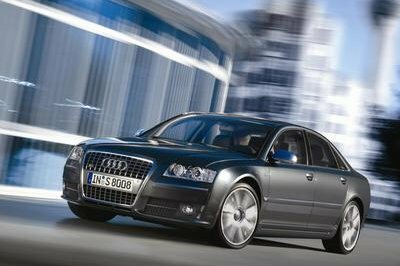 Luxury, four-doors, and speed – it’s a popular combination, one that’s usually associated with the big three German brands of Audi, BMW, and Mercedes-Benz. And while the Teutonic-dominance of this segment is well established, the Japanese are closing fast. 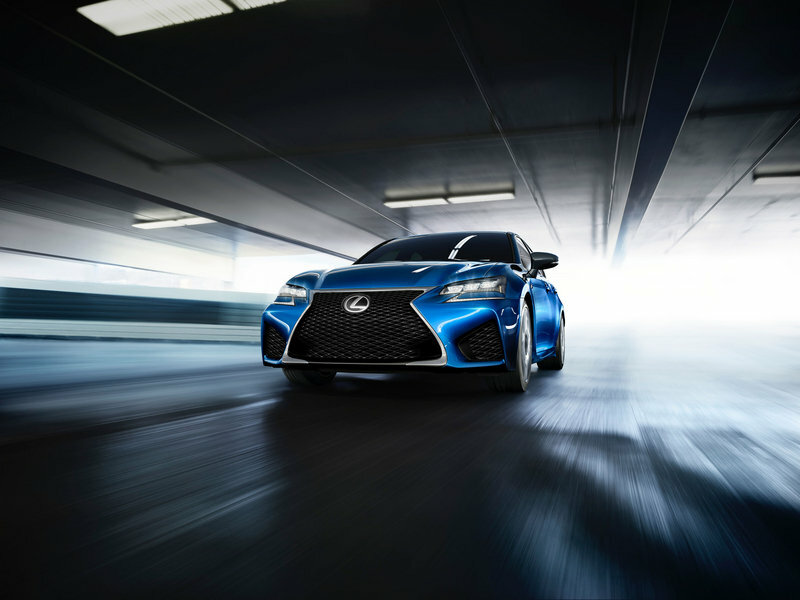 One of the latest attempts at upending the executive sports sedan status quo comes from Lexus with the mid-size GS F, the newest addition to the brand’s go-faster F lineup. Based on the GS 350 F Sport, the GS F comes with a larger engine, stiffer chassis, a trick differential, and new suspension, all of which are aimed squarely at models with the letters “M” and “AMG” on the trunk. Before the GS F, there was the IS F and the RC F, not to mention the venerable LFAsupercar. 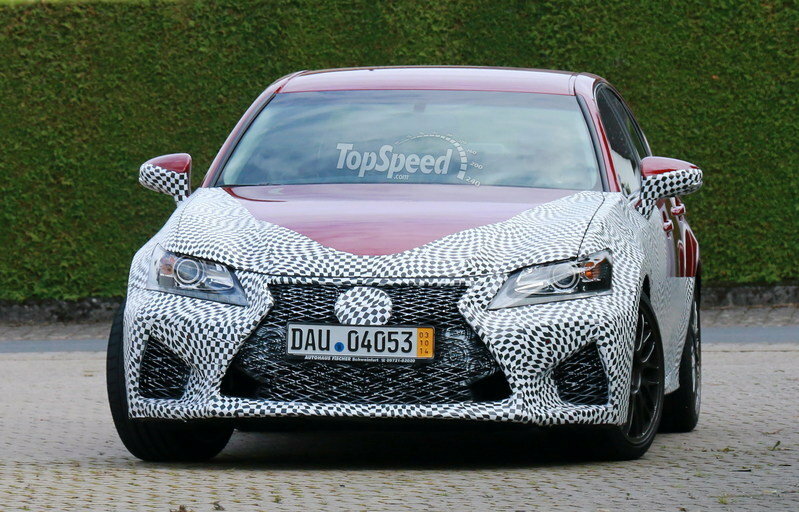 In part, the “F” lettering is a nod to Fuji Speedway, Lexus’ primary test grounds and the place where cars like the GS F are refined for optimum performance. 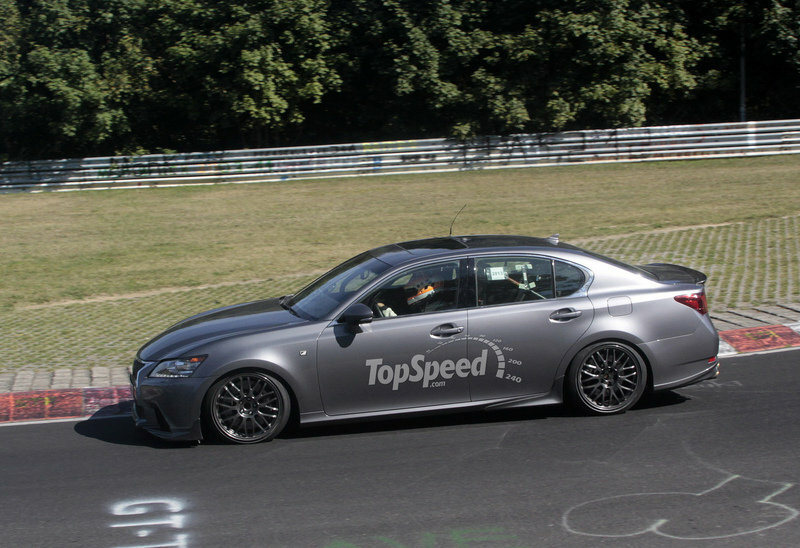 Lexus says the GS F also saw track time at the Nurburgring – ground zero for bragging rights in this segment. But it isn’t just about handling and power – to stand up to the Germans, the GS F needs to bring that elusive Jekyll and Hyde personality of face-melting velocity on the track and backside-coddling comfort on the road. Can the GS F pull it off? Read on to find out. 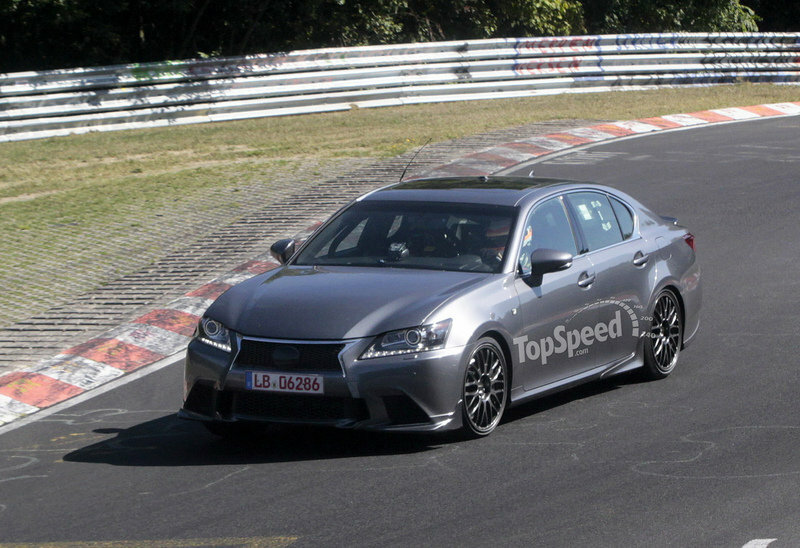 Updated 10/16/2015: On the U.S. market the new Lexus GS F will be priced from $84,440. 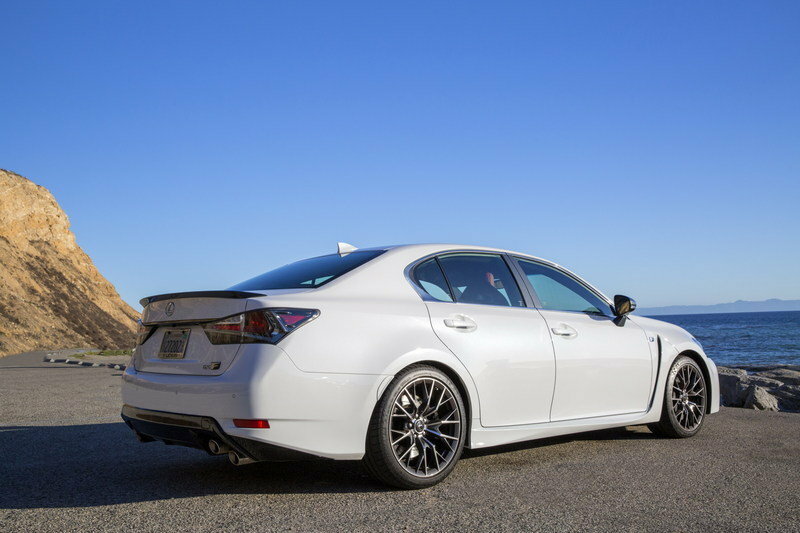 Continue reading to learn more about the 2016 Lexus GS F.
When it comes to the Lexus sedan totem pole, the GS sits above the compact IS and below the full-size LS. However, the GS F is both longer and wider than its standard-issue sibling, mostly thanks to extended overhangs in front and back. Unsurprisingly, the GS F is also lower than the regular GS. As far as styling goes, all the usual Lexus cues are present. No matter what side you’re looking at, you’ll find sharp angles and deep cuts, many of which echo the RC F coupe. This includes a front fascia dominated by an enormous spindle grille, complete with the signature F-series mesh. It really doesn’t matter if you don’t like the grille – it’s a trademark Lexus feature at this point, and it isn’t going anywhere anytime soon. Look past the grille and you’ll find newly designed triple-beam headlights underlined by swoosh-shaped LED running lights. The flanks come with redesigned side skirts and wider fenders, while in the corners are fresh, lightweight 19-inch forged aluminum wheels wrapped in low-profile Michelin Pilot Super Sport tires (255/35ZR19 in front and 275/35ZR19 in the rear). Under the spokes sit large brake calipers, which are offered in an optional bright orange finish. Above the wheels, the B-pillar trim is finished in a glossy, dark metallic paint. In the rear are black moldings for the taillights and trunk garnish, plus a reshaped bumper that houses the characteristic F-series quad exhaust tips. Exterior paint options include Molten Pearl, Ultrasonic Blue, Ultra White, Atomic Silver, Liquid Platinum, Nebula Gray Pearl, Caviar, and Matador Red. There are also stabilizer fins in place to reduce turbulence. 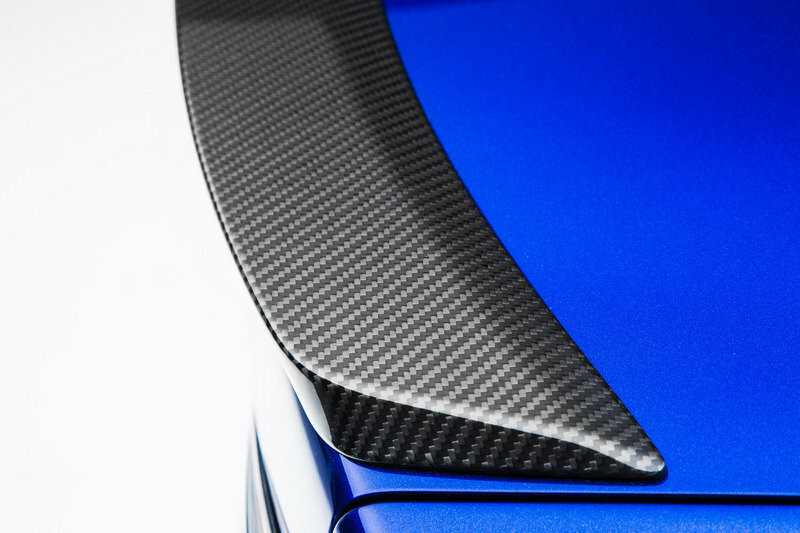 Beyond the unique aesthetics, Lexus says it paid a good deal of attention optimizing the GS F’s aerodynamics, starting with carbon fiber-reinforced plastic (CFRP) molding in the lower front lip. The flared front fenders come with grooved liners and air outlets to reduce pressure and turbulent air coming off the tires, while there are undertrays below the engine and near the car’s midsection to send cool air towards the rear differential. In back is another undertray, which is angled to act like a diffuser. There are also stabilizer fins in place to reduce turbulence. The side-mirrors were reshaped for better aero, while a CFRP spoiler is attached to the rear trunk lid to complement the front lip. One final functional exterior feature of note is found in the front bumper, where the fog lights are replaced with intakes that direct air into specialized ducting designed to keep the brakes cool. One of the most critical areas of the GS F’s speed/luxury balancing act is the cabin, where driver focus meets driver comfort in a variety of different ways. There are F-exclusive bucket-style sport seats with large side bolsters and high backs. Space for people and things is roughly the same as in the standard GS, with seating for five and room for up to four golf bags, plus a trunk pass-through for slightly enhanced practicality. Up front, you’ll find F-exclusive bucket-style sport seats with large side bolsters and high backs. There are heating and ventilation functions, plus leather upholstering. F logos are embossed on the headrests. Drivers enjoy a multifunction three-spoke steering wheel, as well as a short-stroke for the shift paddles, shift knob, and pedals. There’s digital instrumentation, including a TFT tachometer that varies its graphical appearance and displayed information in accordance with the four selectable drive modes (see the Drivetrain section for details). 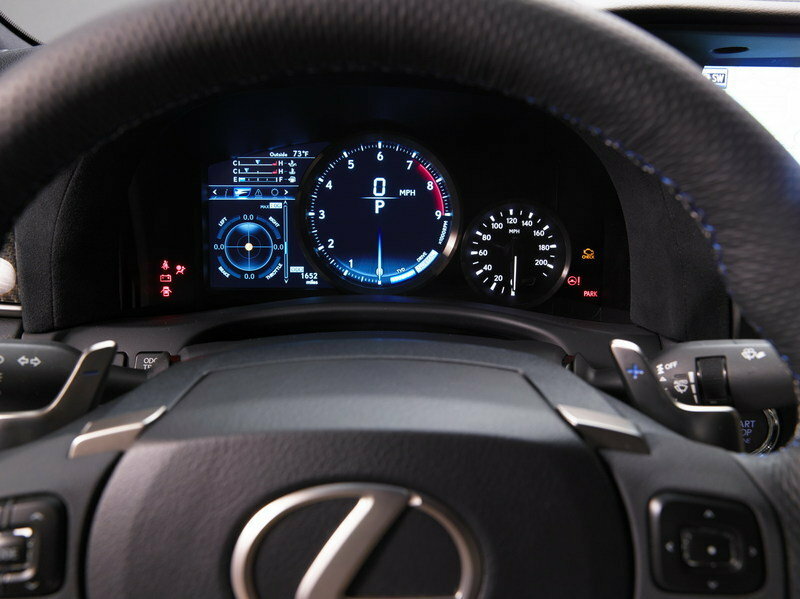 There’s also a standard heads-up display that projects the current road speed, tachometer reading, and gearshift info. Interior illumination comes courtesy of LEDs, while carbon fiber replaces wood on the dash, plus complementary Metallic Dark Silver paint and Alcantara surfaces. Interior color schemes include Stratus Gray, Black, and Circuit Red. One of the most polarizing features is the Active Sound Control (ASC), which adds a bit of aural performance flavoring to the driving experience. Lexus says ASC “synthesizes and assists” the exhaust note, sending it to the passenger via the interior sound system. Volume rises with the revs, with intake and mechanical noises sent through the front speakers and low exhaust tones sent through the rear speakers. There’s a switch that lets you deactivate ASC, but this feature is sure to ruffle at least a few feathers out there. 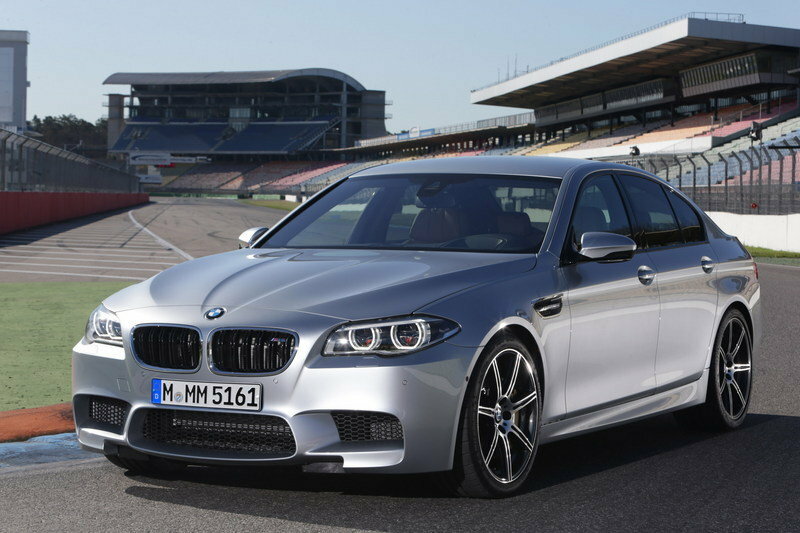 It’s like makeup for your exhaust, and while I personally prefer my internal combustion noises au natural, it should be mentioned that the BMW M5, one of the GS F’s chief rivals, is also guilty of synthesized engine noises. In that respect, I suppose it’s excusable. Speaking of audio, there are two stereos available – a standard 12-speaker system with a 299-watt amp, microSD card slot and Coherent Source Transducer technology, and an optional 17-speaker Mark Levinson system with an amp capable of putting out the equivalent of 750 watts and GreenEdge speaker technology. The user interface is enhanced thanks to a 12.3-inch Electro Multi Vision (EMV) touchscreen, which offers control over settings for the audio system, HVAC, phone integration, navigation, and others. There’s also an available Remote Touch Interface for computer mouse-like inputs, and an Inrix information display that allows you to obtain info like current location, weather forecasts, and fuel prices on your phone. Finally, there’s an S-Flow energy-saving A/C system that can automatically detect how many passengers are onboard and adjust its settings accordingly. Behind the enormous grille lies an enormous engine – a 5.0-liter V-8. It’s the same powerplant used in the Lexus RC F, which means output is matched at 467 horsepower and 389 pound-feet of torque. It’s one of the few remaining naturally aspirated big-displacement eight-cylinder engines out there, and it’s coming from the same company that makes the Prius. That’s kinda funny, if you think about it. Or tragic, depending on your point of view. But I digress. The V-8 uses lightweight forged connecting rods and valves made from titanium to help it spin up to a heady 7,300-rpm redline. It also comes with Lexus’ variable valve timing technology (VVT-iE), advanced D-4S direct injection, and a high 12.3:1 compression ratio, all of which bless it with relatively decent efficiency. Exact numbers are still forthcoming, but it’s estimated to return similar results as the RC F, which posts 16 mpg city, 25 mpg highway, and is certified as an ultra-low emission vehicle. But enough of that. Let’s talk about the important stuff. Acceleration figures look like 4.4 seconds in the sprint to 60 mph and a top speed of 168 mph, all of which plays out to that rumbling V-8 baritone soundtrack. The GS F comes with only one transmission – an eight-speed Sport Direct Shift (SPDS) automatic. It uses a die-cast aluminum case and internal components to keep the weight low, and it’s equipped with G Force Artificial Intelligence Shift control (G AI-Shift). This system monitors things like throttle position and g-forces to offer up the optimum shift map (basically higher revs and quicker shifts when driving aggressively). In back is an available torque vectoring differential for maximum traction. 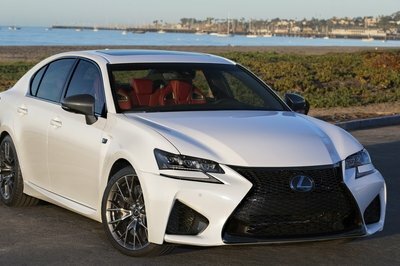 It’s the same unit that debuted on the RC F, and it offers three settings to tweak the GS F’s handling – Standard (best for normal, everyday driving), Slalom (crisper turn-in and better rotation), and Track (you know what it’s for). The diff is pretty smart too, monitoring throttle position, braking, yaw rate, and g-forces to help you get the most from those rear tires. Finding the right balance between sportiness and comfort can be tricky when it comes to the suspension, but given the GS F’s extensive racetrack development, you shouldn’t worry about it being too soft. Up front is a double-wishbone set-up with lightweight forged aluminum upper and lower control arms, while the rear is a multi-link, also with aluminum control arms. The shocks come from ZF Sachs. Lexus increased chassis rigidity with new front and rear body braces, and there are new mounts used in the rear suspension. The electric power steering was also updated. Brembo was called upon for braking duties, including large, aluminum mono block calipers all around, with six-piston units in the front and four-piston units in the rear. The rotors are slotted and ventilated, measuring in at 380 mm (14.96 inches) in front and 345 mm (13.58 inches) in the rear. There’s a vertical g-sensor to help maximize braking performance, and don’t forget about those cooling ducts from the front bumper keeping it all nice and chilly. Drivers can choose between four different driving modes – Normal, Eco, Sport S, and Sport S+. These alter things like the synthesized engine note, throttle response, ancillary component draw, transmission settings, and steering response. Speaking of electronic wizardry, there’s also a new Vehicle Dynamic Integrated Management (VDIM) system, which ties together the ABS, stability control, and traction control into two broad settings – Sport and Expert. Sport keeps the assists, while Expert turns them off. The NHTSA has yet to post crash test ratings for the 2016 GS F (or previous model years of the GS 350, for that matter). However, the IIHS did give the 2015 GS its highest “Good” rating in all four categories, and the 2016 GS F should post similar results. The GS F includes a host of safety features, like a standard SRS airbag system, Drive Start Control (which reduces acceleration and issues a warning when making an uncommon shift, such as from drive to reverse), a security alarm system, and an ultrasonic break-in sensor. There’s also several active safety systems, such as parking assist monitor, rear view monitor, blind-spot monitor, and rear cross traffic alert. Finally, there’s the standard Lexus Safety System +, which includes automatic braking, lane departure warning, automatic high/low beam headlights, and adaptive cruise control. Originally revealed at the 2015 Detroit Auto Show, the 2016 Lexus GS F will be put on sale at a starting price of $84,440. Taking on the M5 is no easy task. This Bavarian rocket ups the ante with a twin-turbo 4.4-liter V-8 that produces 560 horsepower and 500 pound-feet of torque, launching this massive four-door to a 4.2-second 0-to-60 time. 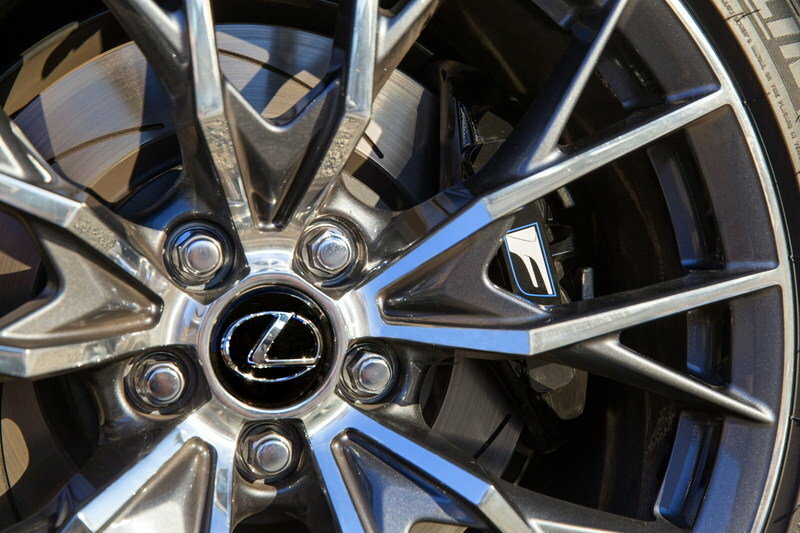 Like the Lexus, there are plenty of tech tricks to keep it planted when carving up a corner, while buyers can choose between either a seven-speed dual-clutch automatic or a six-speed manual transmission. It’s quite the package, but prepare to pay for it – pricing starts at $94,100 before options. 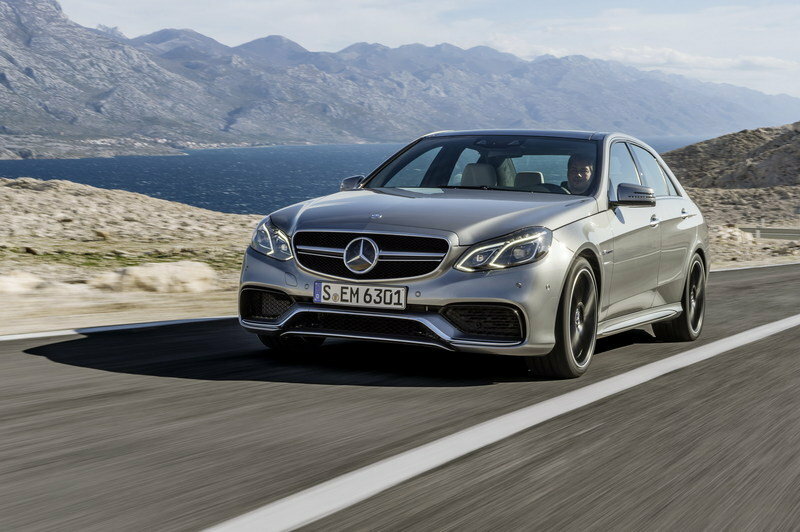 Mercedes has it’s own twin-turbo V-8 weapon, and it’s called the AMG E63 S. A total of 577 horsepower hits all four wheels through a 4Matic performance AWD system, yielding an astonishing 3.5-second 0-to-60 time. There’s also a standard seven-speed AMG Speedshift MCT transmission, multiple driving modes, and optional carbon-ceramic brakes. But like the Bimmer, entry is anything but cheap – pricing starts at $101,700. It’s tempting to follow after the Germans when comes to creating a mid-size executive sports sedan. 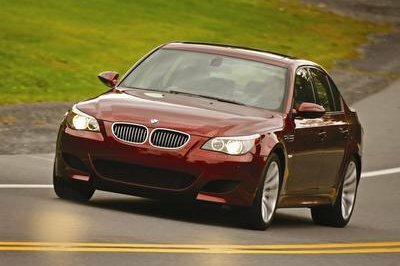 Models like the M5 and AMG E63 basically set the bar in this segment, and their combination of blistering performance and high levels of luxury is impressive. They really do offer that highly sought-after split personality. By comparison, the GS F is still very fast – maybe not as quick in a straight line as the BMW or Merc, but absolutely exciting nonetheless. 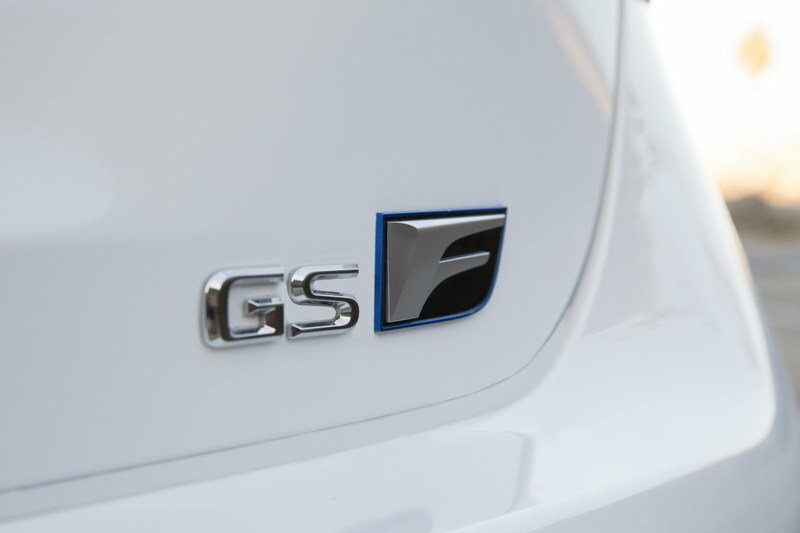 The GS F is also quite luxurious – perhaps not as refined as the BMW or Merc, but certainly top-shelf. At the end of the day, this alternative from Lexus offers the same attributes as its competitors, but reaches that amalgamation of comfort and speed from a direction all its own, starting at the spindle grille, and ending at the burbling naturally aspirated exhaust note. And best of all, it’s offered at a much lower price. Sure, you could go with the Germans, and who would blame you? They’re the standard bearers here. But the Lexus is different, and I believe the smarter buy. Lexus is yet again showing its sporty disposition and rumbling into Detroit. The luxury vehicle manufacturer has announced the much-anticipated GS F performance sedan, which combines a refined four-door package with the speed and agility of a premium sports car, will be revealed at the North American International Auto Show on Tuesday, Jan. 13 at 8:40 a.m. EST in the Lexus display at Cobo Center in Detroit. 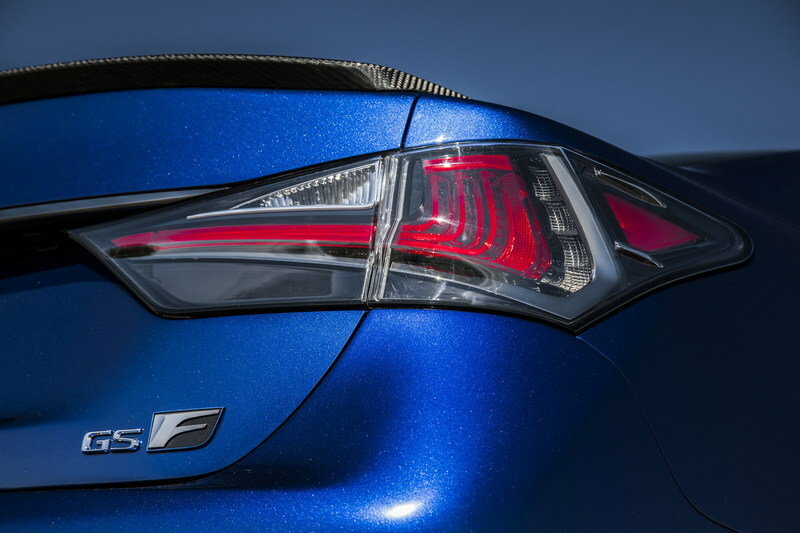 The GS F will be the latest vehicle to join Lexus’ high-performance “F” line that already includes the RC F coupe. 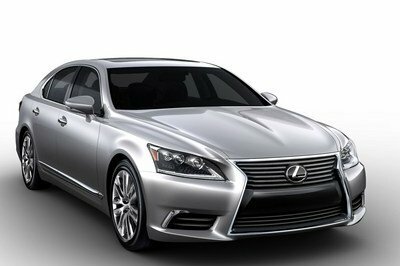 Although the GS 350 F SPORT shares the same platform as the new GS F, they should not be confused. 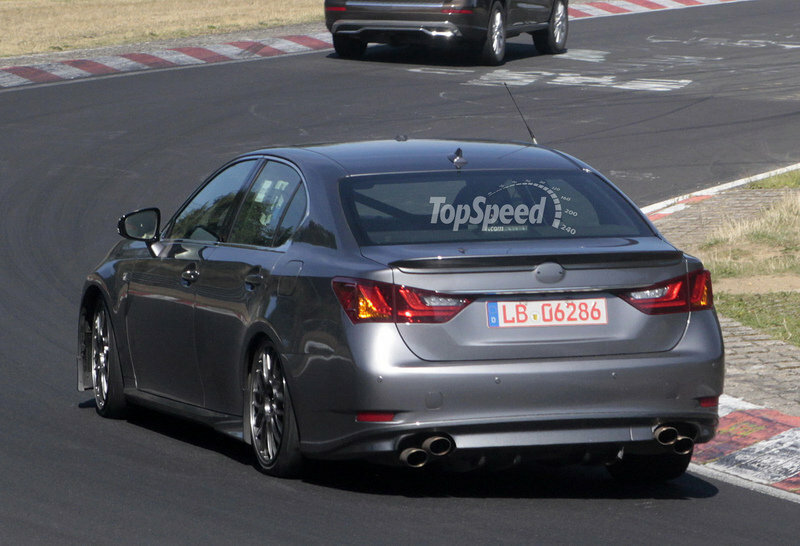 The GS F will have enhancements throughout, including to its engine. Under the hood will be a responsive, naturally-aspirated 5.0-liter V8 that produces a remarkable 467 hp (473 PS )* at 7,100 rpm and peak torque of 389 lb.-ft. (527 Nm)* at 4,800-5,600 rpm. This sophisticated engine uses both Otto and Atkinson combustion cycles to maximize power and efficiency in given situations. 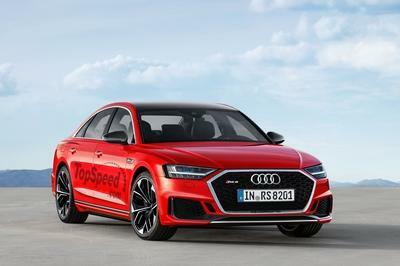 Befitting the nature of this high performance sedan, the engine will be mated to a lightning quick eight-speed automatic gearbox with manual-shifting capabilities. Track emphasizes control during high-speed circuit driving. The GS F unibody will also feature structural reinforcements and suspension exclusively designed to optimize this super sedan’s handling envelope without detracting from its ride quality. Drivers will appreciate the GS F’s handling and smoothness on the open highway as well as the sedan’s ability to devour challenging roads, whether they’re winding up the side of a mountain or at a racetrack. The new GS F will offer drivers a very balanced sedan with genuine dual personality, equally adept at trimming lap times and the commute back home. Throaty rumbles and nimble handling aren’t just for sport coupes. 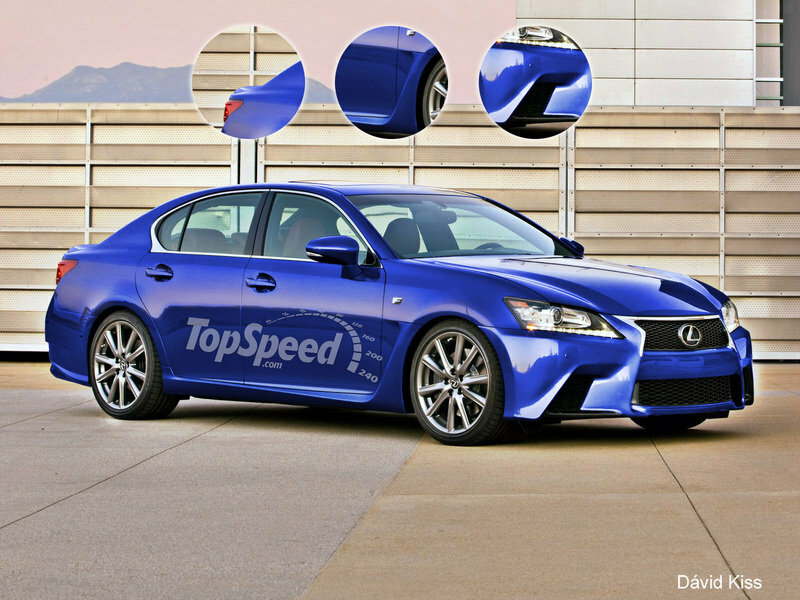 Meet the all-new 2016 Lexus GS F performance sedan. It is not a standard luxury sedan or track car. The GS F rolled into the North American International Auto Show today with a growl, four doors and enough cabin space to comfortably accommodate five adults. The GS F sports sedan, which combines a luxury cruiser with the handling of a sports car, is the latest vehicle to join the company’s high-performance “F” lineage that began in 2008 with the IS F sedan, then the fabulously exotic LFA in 2012, and just last year, the RC F coupe. 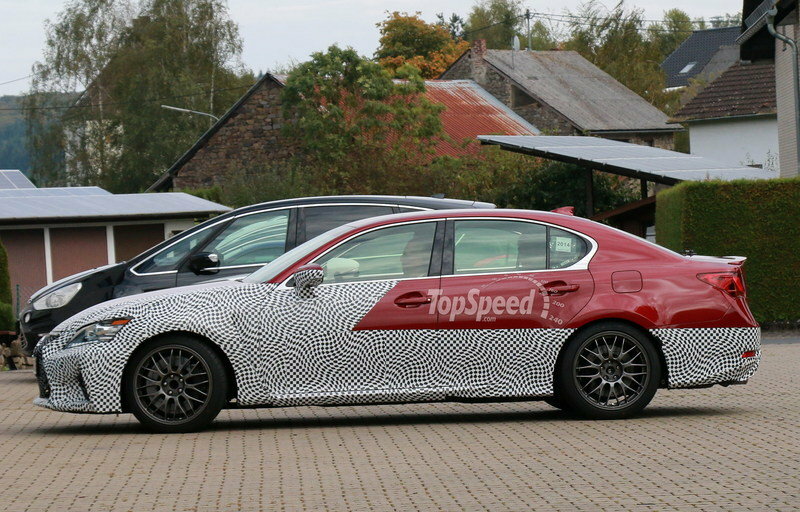 Based on the mid-size GS luxury sedan, the GS F should not be confused with the GS 350 F SPORT. 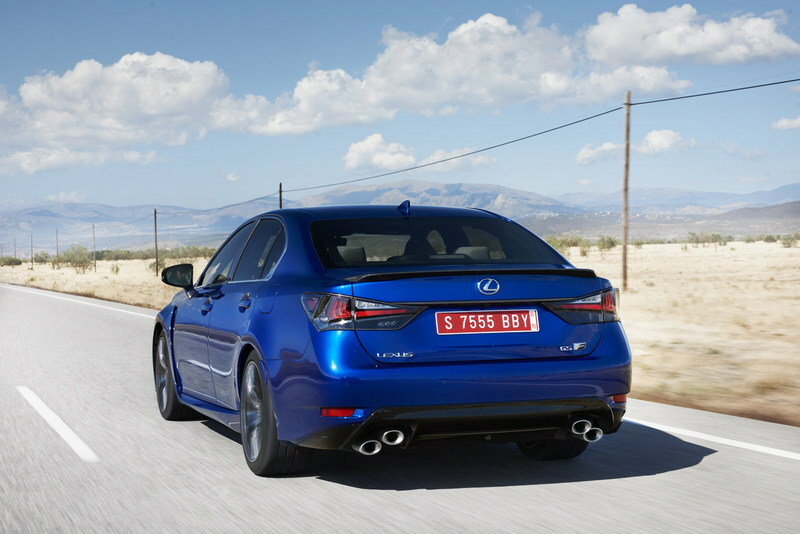 The GS F builds upon the GS 350 F SPORT with a comprehensive set of upgrades that re-engineer the car. 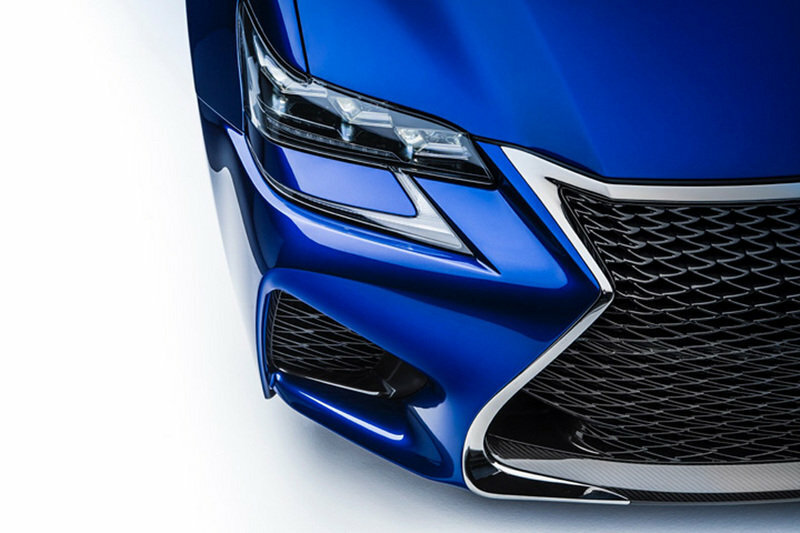 From its engine, to its driveline, suspension and overall tuning that optimizes its reflexes, the GS F is an entirely new animal to the Lexus showroom. 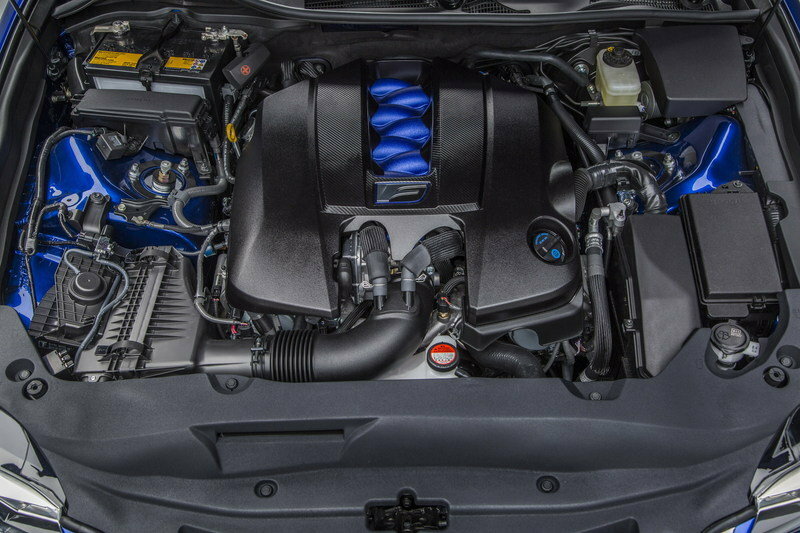 Under the hood will be a naturally-aspirated 5.0-liter V8 that produces a sonorous 467 hp (473 PS)*and peak torque of 389 lb.-ft. (527 Nm)* with a 7,300 rpm redline. The powerplant will be mated to a quick-acting eight-speed automatic gearbox with paddle shifters for manual-shifting capabilities. The GS F also has four different driving modes: Normal, Eco, Sport and Sport S+, the latter designed specifically for the racetrack or your favorite challenging road. As sweet-sounding and powerful as the engine is, the DOHC 32-valve powerplant can offer a measure of fuel efficiency, incorporating the Atkinson cycle in certain driving conditions. 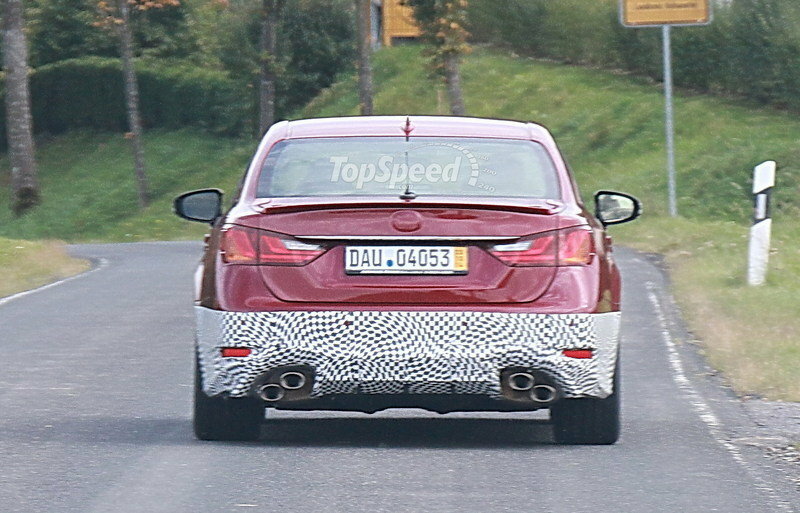 The GS F will feature structural reinforcements and an exclusive suspension system matched to the car’s added power. The newest member of the “F” line boasts a level of handling and agility uncommon in a mid-size luxury sedan that was honed on Japanese circuits such as Fuji Speedway and perfected on the famous Nürburgring Nordeschleife. The GS F’s impressive track and twisty road manners are the result of a custom firm suspension, along with wider forged wheels shod with staggered Michelin Pilot Super Sport tires (255/35-19 front, and 275/35-19 rear). The suspension combined with an enhanced braking system relying on 15-inch front rotors that are available with bright orange 6-piston calipers help give the GS F remarkable high-speed handling and braking capability. Carrying over 300 pounds less mass than key German sedan competitors, the GS F offers a near sports car level of nimbleness and agility. These features help provide near-neutral handling balance and a high degree of driver control. The GS F features a unique version of Lexus’ trademark “spindle” grille, with a distinctive mesh pattern reserved for F models, and large gaping air vents that have been integrated into the front fascia. 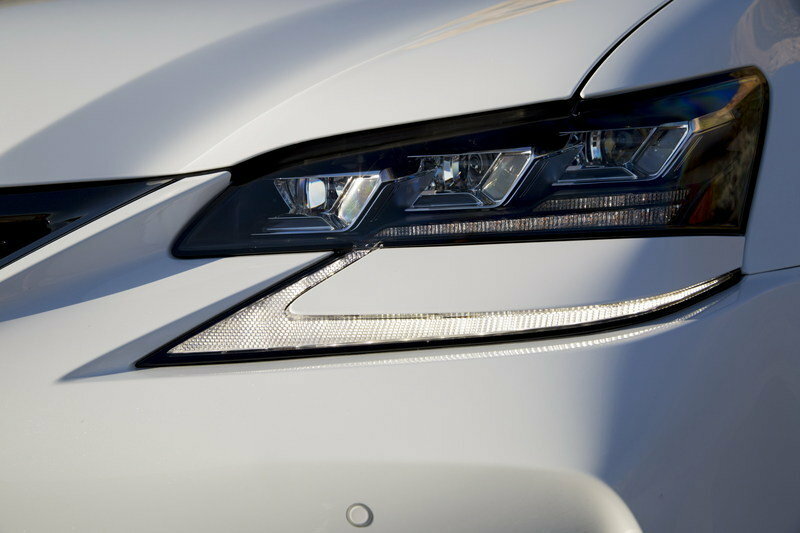 Slim canted LED headlights with the signature Lexus L-shaped daytime running lamps complete the car’s aggressive face. The GS F sits noticeably lower and wider than other GS models, resulting in a planted stance that, along with its front fender air outlets, forged 19-in. alloy wheels, and carbon fiber accents make it instantly recognizable as an F model. 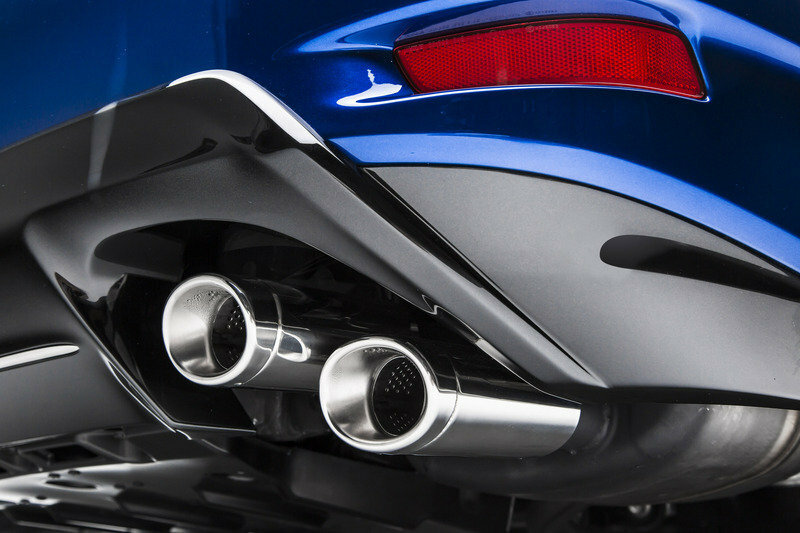 The rear is highlighted by a subtle carbon-fiber rear spoiler and trapezoidal tailpipes with four chrome exhaust tips that powerfully suggest that this car is meant to be driven hard. Inside the sheet metal, the GS F’s cabin is designed to exude the look and feel of a jet fighter’s cockpit. The interior is styled in an elegant form-follows-function theme, with all controls placed within easy reach of the driver. Residing behind the exclusive “F” branded steering wheel, is an electronic instrument cluster that can be configured among four different displays, depending on the driver’s preferred driving style: Normal, Eco, Sport S and Sport S+. Also, custom front and rear seats have been implemented to provide the vehicle’s occupants with more lateral support while not sacrificing comfort. Along with all the sporty touches, the GS F retains a luxurious feel, thanks partly to the high-grade Alcantara trim on the doors, on the center console and above the instrument panel. An analog clock adds a touch of class to the already elegant dashboard that features a 12.3” central video monitor controlled by the Remote Touch Interface on the center console. 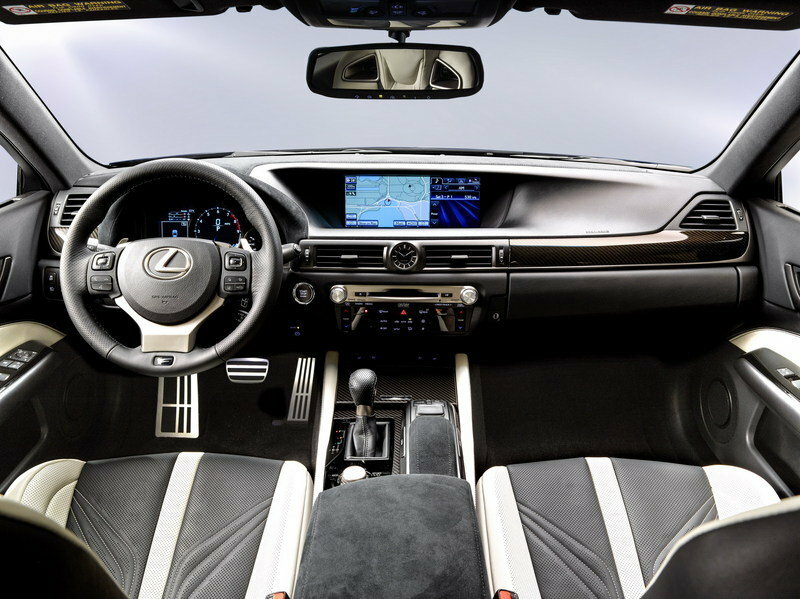 The GS F offers the optional 17-speaker Mark Levinson Premium Audio system that will satisfy the most demanding of audiophiles, but when drivers want to listen to the music provided by the engine, they can simply change the drive mode to “Sport” or “Sport S+” to engage the Active Sound Control. 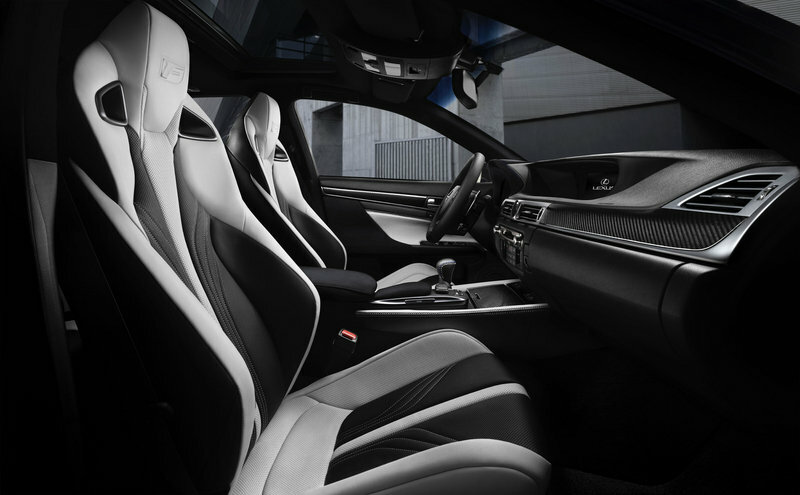 The Active Sound Control system is similar to the one found in the RC F but is enhanced with rear speakers. All occupants can enjoy the driving experience complete with robust exhaust note. The GS F will feature an updated suite of standard safety features including Pre-Collision System with automatic braking and pedestrian detection, Radar Cruise Control with full stop from certain speeds, Lane Keep Assist, Automatic High Beam and Blind Spot Monitor with Rear Cross Traffic Alert. This package of features is called Lexus Safety System+. Motorsports has become a growing passion for Lexus, evidenced by its active participation in the Super GT racing series when it introduced the SC 430 GT500 racecar in 2006, and the launch of the RC F to Super GT racing series in 2014. With the debut of the RC F GT3 concept last year, Lexus has every intention to be part of the international GT3 competition in 2015. As further proof of its intentions to develop a globally unified approach to top tier racing, Lexus has created a new organization to spearhead such efforts and introduced the new Lexus Racing logo at the North American International Auto Show.